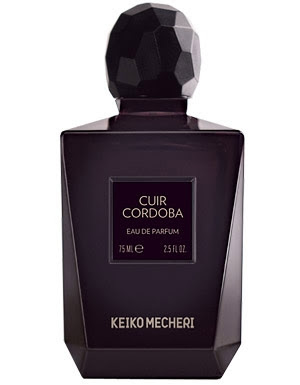 When I wrote about Keiko Mecheri's Datura Blanche, launched in 2009, I also mentioned Serge Lutens' 2001 Datura Noir, and with good reason: they're exceedingly similar, except the Mecheri is far stronger and sweeter then the Lutens. When I smelled Mecheri's Cuir Cordoba (also 2009), my immediate response to it was that it was a copy of Lutens' 2004 Daim Blond, except much louder, much leatherier, much irisier, and much sweeter--noxiously so in each respect. 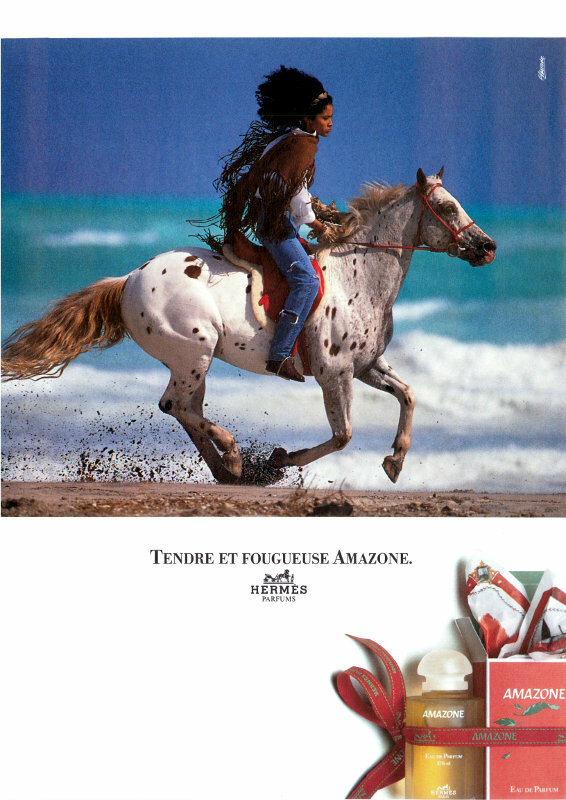 I am not saying that Mecheri is deliberately aping Lutens' work but increasing the wattage for shock effect, for people--who are they?--who don't think Lutens' scents are potent enough. It could certainly be a coincidence. And that it all I have to say about that. If you like huge quantities of iris, then perhaps this is your cup of tea. On me it's horrifying. 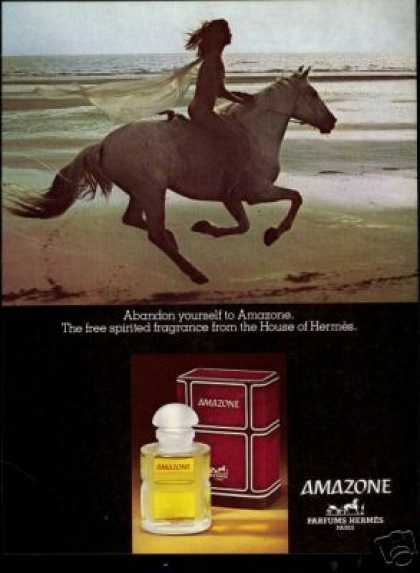 After two blockbusters, the Alfred Sung marketing people could probably have been forgiven for assuming that the next scent was a sure-fire hit, but Encore didn't stick around very long, and I don't know why. 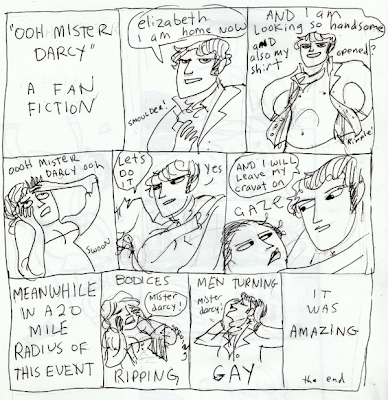 Okay, I have a couple of theories. It's not immediately beautiful (although I have to say that the big white-floral original wasn't, either): the top is sharpish and a little violent. 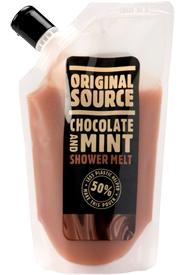 In fact, it's sort of odd: when I bought mine not long after its launch, it came with some bath products (probably shower gel and body lotion) in a little drawstring bag, and the bag smelled like Coca-Cola syrup. 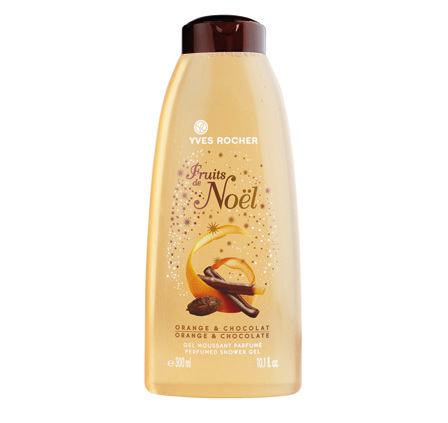 If you've ever worked with this stuff, you know just what it smells like, and the drydown of Encore does in fact have a distinctly cola-syrup smell to it. Cola smells mostly of sweetened cinnamon, vanilla, and citrus oils, with some other spices thrown in, and although there are many orientals out there with those elements, somehow in this scent they combined, or were combined, to give a definite soda-fountain effect. 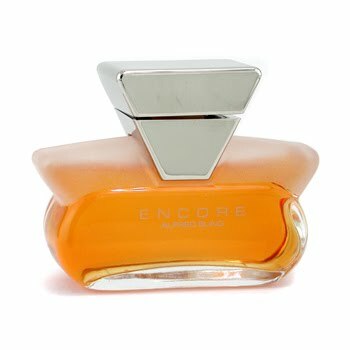 After the big, brittle citrus-aldehyde top, Encore turns into an extravagant floral oriental with lots of tuberose allied to that cola accord. 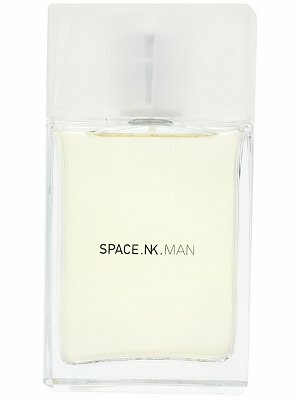 It is very large, very richh, and very imposing, and I think that might have been the second part of its problem: it was a throwback to the eighties in a time when lighter, less aggressive scents were starting to take over. You could never accuse Encore of being modest. And it lasts pretty much forever, too. Here's how durable it is: last week around let's say 6:30 a.m. I put some on the back of my hand (as ever) so I could think about it. An hour later, I did the dishes, showered, put on some A*Men Pure Coffee, which is pretty potent stuff, and headed out the door to go to work. 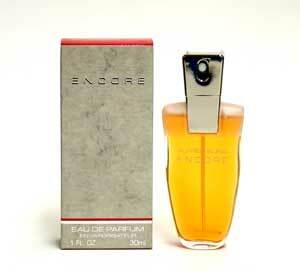 A few hours later, I was sure I could smell Encore, and I could. I arrive home from work at around 6:30, grabbed some supper, and sat down at the computer, and twelve hours after I had originally put on the Encore, I could still smell it. It survived not one but two complete washings, plus however many hand-washings I might have performed at work, and a twelve-hour day. 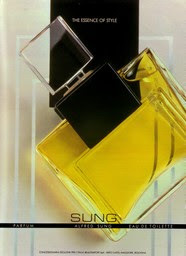 At any rate, Encore wasn't a big success, and so the next few Sung scents were not absolutely unlike the best-selling floral original: 1992's Sung Spa, 1995's Forever, and 1997's Pure were all white or white-ish florals, and Sung never did make another full-blown oriental. Still, they must have sold Encore for a few years, and they must have produced a hell of a lot of it, because you can still find it if you hunt for it. (I bought a bottle of Encore maybe five years ago, and I'm certain it hadn't been reformulated; it might be the case that it wasn't around long enough for that to be an issue.) PerfumeLA has it, and although it's rarely a good idea to buy something unsniffed, sometimes you get a pleasant surprise. If you want a proper old-style floral oriental that doesn't smell like anything you already own, this could be just such a surprise. *Actually, I think that's the EDP pour bottle: the perfume bottle had a translucent frosted cap. I think. 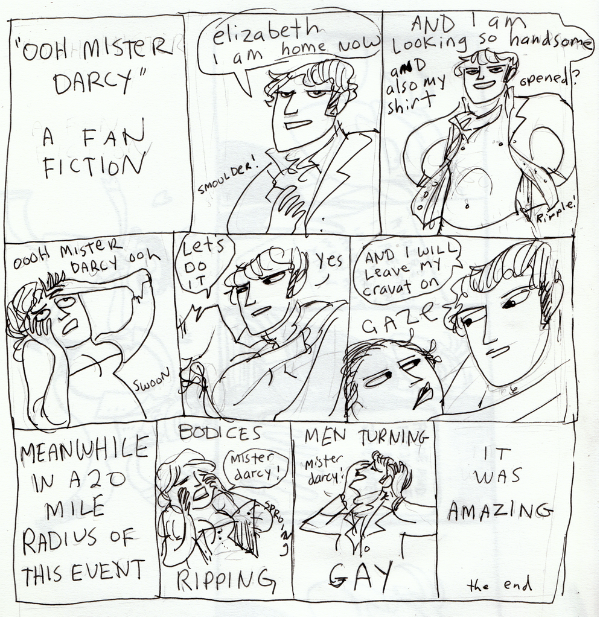 Seriously, you should read her all the time, because she's brilliant and hilarious. On December 31st or January 1st I was going to do a wrap-up of the year and write a little more about my neurological oddity, clear up a few things, add stuff I had forgotten, but it turns out that writing more about it is just as hard as writing about it was in the first place, so that's going to have to wait, although I did want to thank everyone who commented, because you were all really nice. And to think I was so worried about exposing myself so completely! 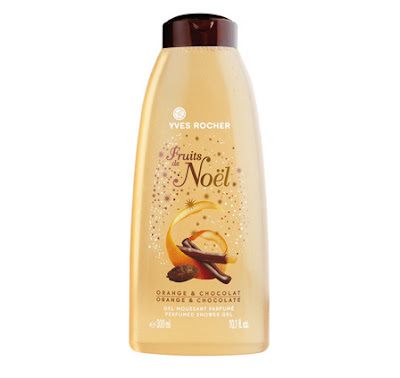 As I mentioned in late October, I got some Yves Rocher shower gel and hand soap in their limited-edition holiday Orange and Chocolate scent, and it is lovely stuff, which it would appear you can still buy, although I am going to warn you that the texture of these liquid soaps (which are identical in every way except the bottle) is not that great, being far too runny--more corn oil than corn syrup. 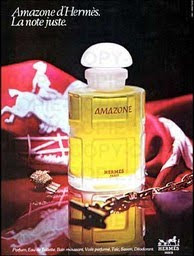 But the smell is enchanting, and it's well worth the money. But at least you can get that. Unless you live in the British Isles, you presumably can't get any of the next things I wanted to talk about, which in retrospect seems a bit mean, but at least if you're travelling there you can look for them. 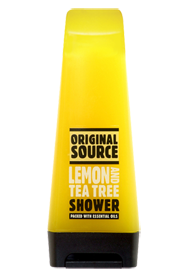 When Jim and I were in the UK this past spring, I bought little bottles of shower gel from a company called Original Source; I got some Lemon and Tea Tree (smells like lemon meringue pie) and Mint (tingly, jazzy, and wide-awakey), and knew I had to get some more before I left. When I went to look for it in London before heading home, I couldn't find the Lemon, so I bought Lime instead. 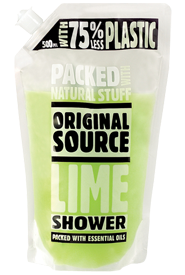 Some of Original Source's products are artificially scented, as we will see, but these three aren't, and so the Lime smells strikingly fresh and realistic. Jim tried some a couple of months after we got home and was instantly addicted: he doesn't like most artificial scents, but this smelled like the real thing. We tried to get some lime oil to put into an unscented shower gel, but there were two problems: 1) we couldn't find lime oil locally (though we could have ordered it for a fair bit of money), and 2) we couldn't find truly unscented shower gel (since even "unscented" or "fragrance-free" on a package doesn't generally mean that, and if it did, you probably wouldn't buy the product). 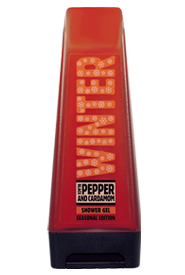 Winter, which supposedly consists of black pepper and cardamom but which also has other fragrance notes in it ("parfum" on the label), and I should say so, because it smells gorgeously like a very strong, spicy late-seventies or early-eighties men's cologne. (The word "WINTER" on the label appears to be set in lights like a marquee, but those are actually snowflakes, in case you were wondering.) I was going to use it on December 21st, but I kept forgetting until last night just before going to bed when I took it out of the storage closet so that I could shower with it this morning. The texture of all the Original Source gels is perfect--smooth and thick, just liquid enough so that it disperses instantly in water in your hand or on your skin. As I seem to feel the need to state every now and then, the Original Source people--who as it turns out are not affiliated with Boots, as I mistakenly surmised back in May--are not paying me to say any of this, although frankly if they want to send me a bunch of product I'll happily receive it, because there are still a lot of their shower gels I haven't tried yet and won't be able to until I get back to the UK, which could take a couple of years, and while I'm at it I have to say that they really, really need to figure out a way to sell their stuff in North America, because it would go over gangbusters here. If you live in the UK, lucky you!